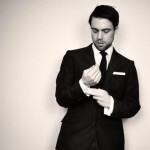 Matt Ferguson is an amazingly talented artist who has found himself very much in demand of late. I first discovered his work after an old school friend who is now a professional musician had a tour poster designed by Matt. After falling down the rabbit hole (see also: the internet), I discovered that Matt was producing some gorgeous alternative movie posters. I can guarantee that most of you have seen at least one, most likely his amazing work on Guardians Of The Galaxy. I was lucky enough to get some time with Matt and ask him some questions about his background, what he enjoys and his aspirations. NTC: So Matt. 2014 seems to have absolutely blown up for you. Would you mind giving our readers a little bit of background about you? MF: Yeah. This year has been pretty good so far! I’ve really enjoyed all the projects I have got to work on these past few months. A little bit of background? Where to start? Well I’m an artist based in the UK. I have been making film posters for quite a few years now. I initially did this just as a hobby but it has quickly taken over my life and become a real job. NTC: So what was your very first poster design? Was it inspired by a love of film or a love of iconic posters we use to see in the cinema? MF: This is a good one. 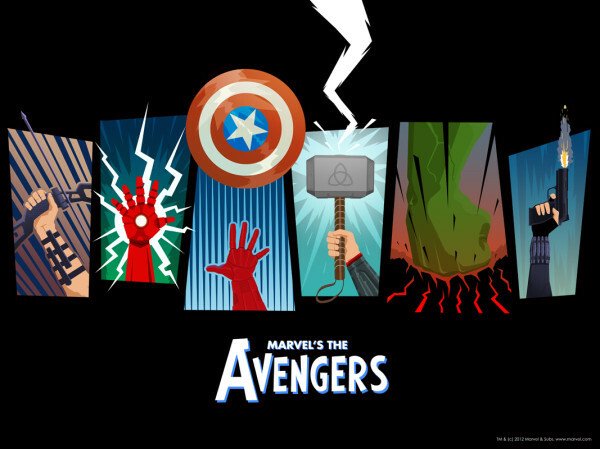 My very first poster design was actually for the Avengers. I had been working as a designer for many years and I found myself fed up with the boring standard posters you see out there so I quite simply made my own, just for fun. What’s pretty amazing is that after I posted it online it very quickly became quite popular and was eventually picked up for official use by Marvel… also the Hulk segment of the poster caught the attention of Mark Ruffalo who had one specially printed which I thought was pretty incredible. So I just went whole hog poster design crazy after that and haven’t looked back since! NTC: Great work! I first discovered you after you made a tour poster for Josh Doyle who I vaguely knew through school in the nineties and the fact we are from the same town. After he put that up on Facebook, I went hunting for more of your work. I was immediately drawn to the fact you were making posters of iconic films that shaped my childhood. Is that something which feeds your creative process too? I mean, would it be presumptuous for me to say that I expect to see the likes of Back To The Future and The Goonies in your portfolio at some point? MF: I am a massive film fan. And I especially love cult films… so the answer is yes I am sure I will get round to doing some prints of those films you mentioned. 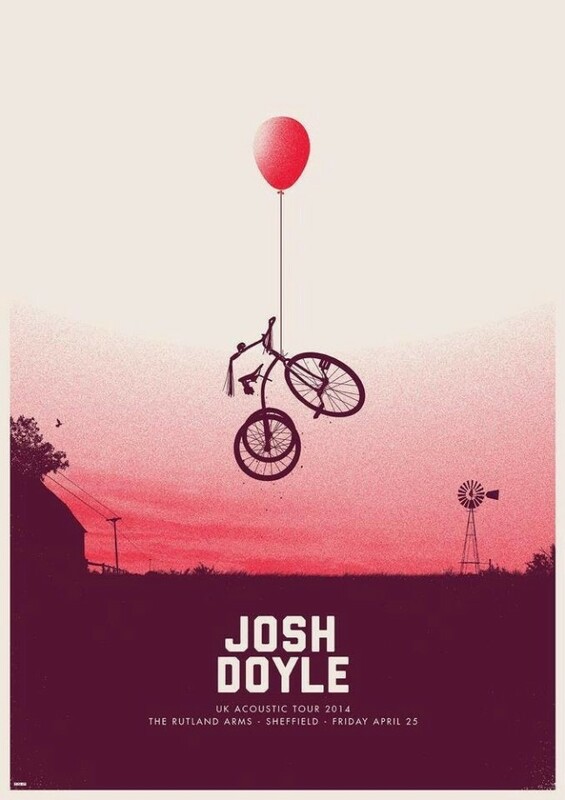 However you also mentioned the Josh Doyle Gig poster which I found to be great fun to do because I had the freedom to just come up with something random and fun. I am definitely going to do more original art as time goes on as well just because I found it to be quite freeing to go with my own random ideas. NTC: I would like to talk a bit more about your process, if that’s OK? Once you know the project, what steps do you take? Do you start doodling or do you undertake a lot of research first? MF: My process is actually pretty simple. Firstly if I don’t know the subject I am tackling I will watch the film, read the book whatever it takes to get to know subject well. Once I feel like I have a feeling what film is about I will start to think up images that I think could look cool or pick something that stood out as a defining image and go from there. I will pull together a library of images that are from the film in question or just give me the same feeling I got when watching, sort of like a mood board I guess. Then I will just start to make a poster and simply go with my gut feelings. For example with my recent Apes poster it was very clear that the film’s main theme was the end of civilisation as we know it, particularly western civilisation, and the start of a new civilisation of Apes so I wanted to show that in a simple and pretty obvious way. In this case I noticed (and loved) the shot of Koba lording it above all the other apes and people on the flag pole. It was then a logical step to have the US flag in tatters which I thought was a pretty powerful image akin to the classic Statue Of Liberty reveal in the original film. This then led me to give the posters a 60s’/Saul Bass vibe with the simple colours and shapes. I think my best work is done is this free flowing way. NTC: Saul Bass is something who I think the vast majority of people in graphic design would cite as an influence and with good reason! Who would you list as an influence who is contemporary? MF: I love to see new stuff from Bruce Yan. So I would say he influences me. For me personally I can’t get enough of the work of Raid71… very inspiring. Honestly though I think all the artists currently working in this field have an influence on me. I love a lot of the work I see floating around the net nowadays and if you like something it’s going to have an influence on you. NTC: Do you think we will ever see the type of posters that Mondo, Gallery88 and yourself put out become the mainstream posters for theatrically released films? Or will they continue to play it safe for the mass audience and then provide something a bit more original and cool to the pop culture geeks/nerds? 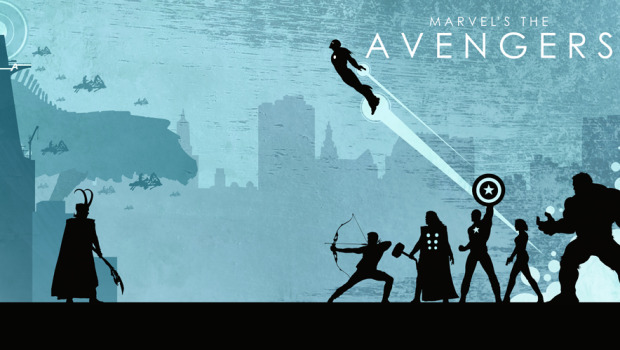 MF: I think it will stay the way it is for now, with it being a secondary thing to the mainstream posters. You do see more studios using art posters for things like IMAX posters etc but I think that’s about as far as it will go. One of the main reasons people like this stuff is because of it’s collectable and underground nature, I think the studios know this and will keep it that way. 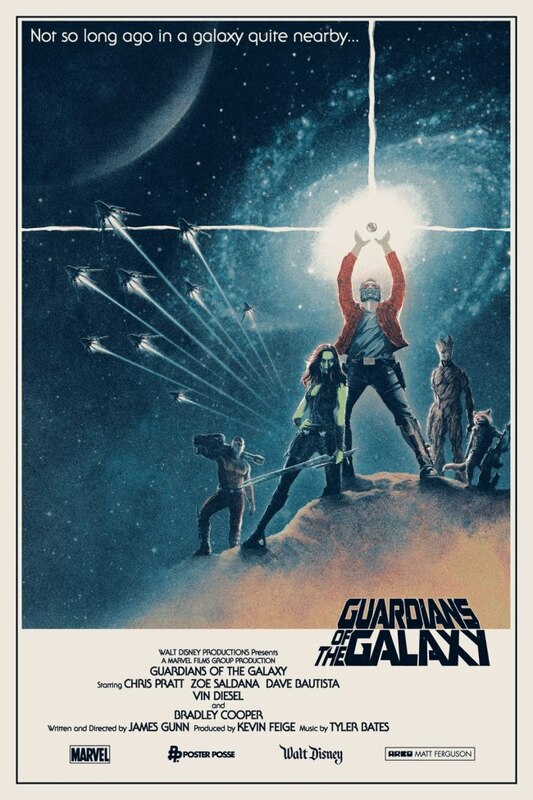 Matt’s gorgeous Star Wars/Guardians Of The Galaxy mash up. NTC: You seem to be becoming more and more prominent on social media. How much do you think that plays into an up and coming artist’s career path these days? Do you think a lot of artists remained undiscovered in the era before social media? MF: I think it’s had a huge impact on my career. Social media allows me to publicly own and share my work, so if I create a particularly popular poster it is very easy for people to find me and get in touch. This obviously helps sales of prints but also in the beginning really helped me as it allowed Marvel to see the stuff I was doing as a fan and get in touch and hire me to work on their properties in a more official capacity. It really did kick start my entire career as a poster artist. It seems to me that a lot of people in the world want to know who made their favourite poster, put a face to the art so to speak. In the days before the internet a lot of industry workers weren’t known outside of certain circles. Now we have public forums online where we can showcase our work instantly to people who want to see it and appreciate it. NTC: Do you think there is a downside to that though? I remember being at LFCC last year and someone was selling prints of your ‘World’s Finest’ piece. With hi-res images now the norm, do you feel that artists can get a bit of a bum deal from those looking to make a very quick and easy buck? MF: Well there is always going to be people who will rip off others artwork. I don’t really let it bother me too much, of course sometimes it does get a bit ridiculous. Someone said to me once that it just shows how popular my work is, so I like to look at it like that and just try and shut stuff down when it pops up. The real fans and collectors know how to spot a fake miles away. NTC: Ok, final question, Matt. Probably the most important of them all. Who is your favourite Turtle and why? MF: Michelangelo because he is a party dude. NTC: Ha! Great answer. Thank you for your time, Matt. Can’t wait to see you at Thought Bubble this weekend. If you want to see more of Matt’s work, you can find him on Twitter, Facebook or at his own website.